Cleans through abrasive action. Always use brick in the presence of water or oil. To clean hard metal and porcelain fire boxes, covers and grill and broiler racks: wet brick. Rub surface to be cleaned using gentle pressure. Rinse or wipe cleaned surface of residue. Your Grillmaster Grill Cleaner will shape to flat or curved surfaces. "Grooves" itself to cooking grids. Coat warm but not hot griddle with cooking oil. Scour griddle using flat side of stone. Work in one direction. To keep oil cure and prevent sticking, clean only carbon and food from griddle. Wipe cleaned surface of residue with dry cloth. U.S. Pumice Grillmaster is the genuine 100% pure pumice char rock preferred by professional chefs for generations. This odorless, tasteless natural gray rock is mined in the High Sierra country of California. Saves Gas Why pumice? Light weight and uniform density. Pumice heats quickly and holds heat. This reduces fuel consumption. Grillmaster rock is univellular in physical structure. It spreads the heat evenly over the grill surface. Fewer "cold spots" put you in control of the desired broiling result. How to Use Place the rock one or two layers deep over the grate. Space to permit air to flow around the rock. Preheat the rock. This will stabilize heat distribution over the grill surface. Adjust flame to desired level and broil. 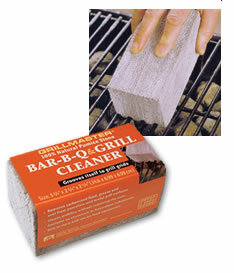 Grillmaster pumice rock will vaporize drippings and glow like charcoal with proper gas level. Change rock periodically. Grease build up creates a rancid "after taste" on food. 13 3/4"x 10 1/4"x 11"
Grillmaster pumice is a natural product. Sizes and weights are approximate.